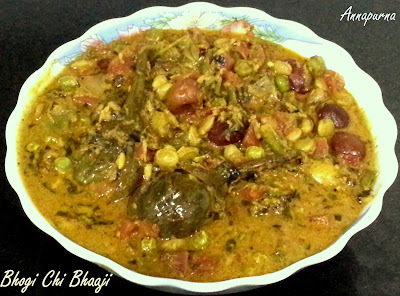 Undhiyu is a traditional Gujarati mixed vegetable curry and the quintessential dish during Uttarayan (Makar Sankranti )festival. 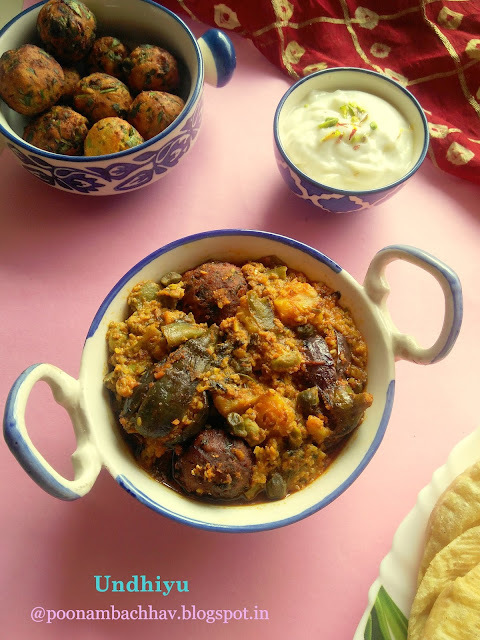 This one-pot dish is very delicious and has few resemblance to the Maharashtrian Bhogichi Bhaji as both the curries celebrates the seasonal bounty of Winter vegetables. This vegetable casserole is typically served with poori and Shrikhand on festive occasions. 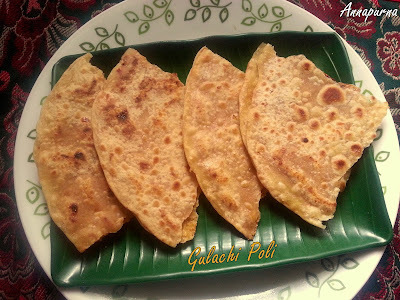 You can serve it with Bajra roti or chapati as well. Here i have shared an easy and guilt free recipe in which all the veggies along with methi muthia are steamed in a pressure cooker. 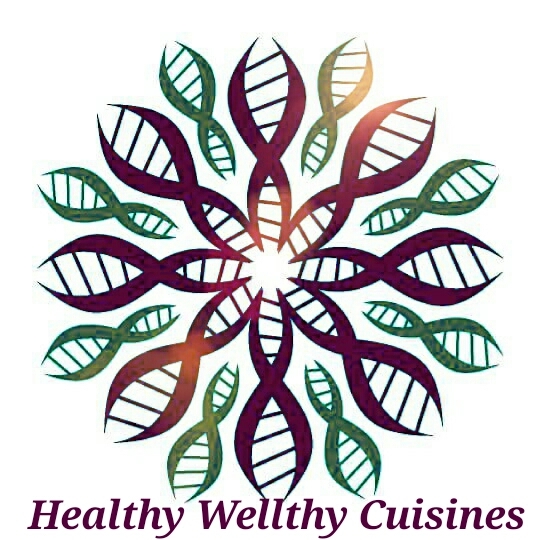 This method requires comparatively less time and oil than the traditional method. I have adapted the recipe from here. Makar Sankranti is one of the most auspicious days for Hindus and usually falls on 14th January. As the first festival in the year's calendar, it is eagerly awaited by one and all. It marks the end of the long winter, as the sun begins its northward journey and so this festival is called Uttarayan also. After sankranthi the days start becoming longer and warmer and the chill of winter declines. Farmers pray on the occasion to be blessed with bountiful harvest. This harvest festival is celebrated in different parts of India by different names. In North India, large bonfires are lit on the eve of Sankranti , known as Lohri. In many states of South India, it s celebrated for 4 day long festival called Pongal. In Gujarat it is known as Uttarayan, in Maharashtra , Makar Sankranti, in Uttar Pradesh as Khichri. Lord Sun is worshiped on this day and people take dip in holy rivers. #HarvestHarmony is the #178th theme on #FoodieMondayBloghop and this delicious and healthy Undhiyu is my contribution to the theme. Wash the baby egg plants, remove the upper stalk and make 4 slit on each of them in such a way that they do not fall apart. String and pod the surti papdi beans. Rinse them well , strain and keep aside. Peel and chop the potatoes, yam, sweet potato and plantain. Mix everything under the list masala in a bowl. Do a taste test. Adjust the seasonings as per your taste. Stuff the masala inside the slits of the brinjal. Take the chickpea flour and chopped fenugreek (methi)leaves in a bowl. Add all the ingredients under the list of muthia in it. Blend well. Add little water and make a slightly sticky dough . Apply oil on your palms and shape the muthia. Deep fry the muthia in batches until they become crisp and golden brown from all sides. Remove them with a slotted ladle and allow to drain on absorbent paper. 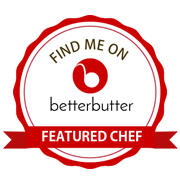 In a pressure cooker, heat 2 tablespoon oil. Add carom seeds and cumin seeds. Fry the seeds for few seconds. Next add asafoetida followed by the green chickpeas and the stringed and pod beans. Stir fry them for a minute or so. 3. Add the sweet potato, potato, plantain and yam pieces. Stir fry them also for a minute or so. Add the remaining masala and blend well. 4. Next add the stuffed brinjal and add 1/2 cup of water to the pressure cooker. Sprinkle salt and cover the cooker with the lid. Cook for just 1 whistle and put off the flame. Open the lid once all the pressure has been released . 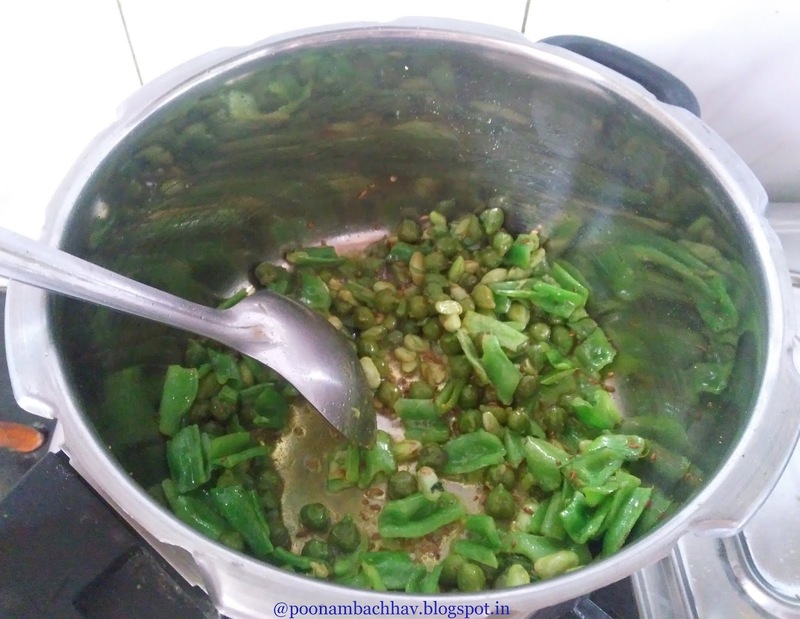 Now add the fried methi muthia and simmer the undhiyu for 4-5 minutes. 5. Serve the delicious undhiyu with poori and Shrikhand . Do not over cook the veggies . The vegetables in Undhiyu should retain their shape and crunch. Left over methi muthia can be served as tea time snack with some chutney or dip of your choice. Undhiyu can be made with available winter veggies. Feel free to substitute one or two veggies as per availability. 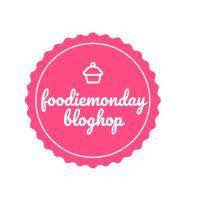 For instance normal potatoes can be substituted for baby potatoes, yam for purple yam etc. 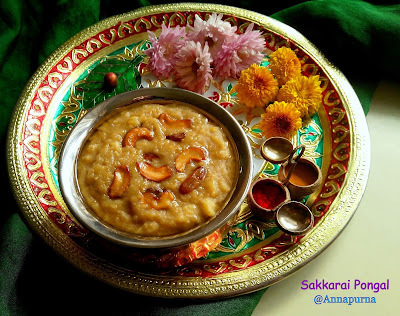 For more Makar Sankranti recipes, check out the following posts from my blog. Thank you so much Priya. I am glad you could relate my post with your cherished memories. Happy Uttarayan to you. Thank you Ravneet. Hope you had a great time celebrating Lohri . A complete winter veg feast is what I call Undhiyu. One cannot have enough of it and the home made muthiyas are absolutely the best! Tastes best with pooris and looks absolutely delicious Poonam. 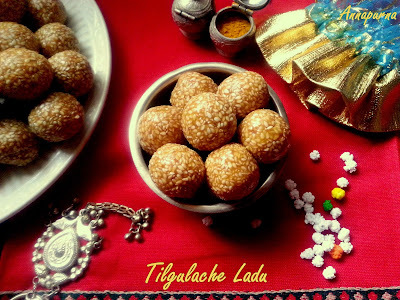 Makar Sankranti chi shubhecha tumha sarvana. 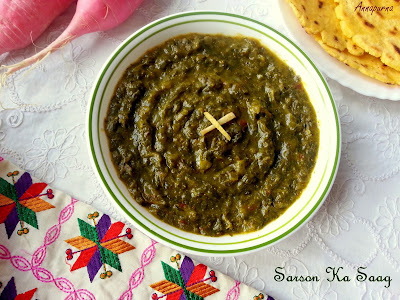 This one of my favourite dishes and I do not need any rice or chappati to eat with it. 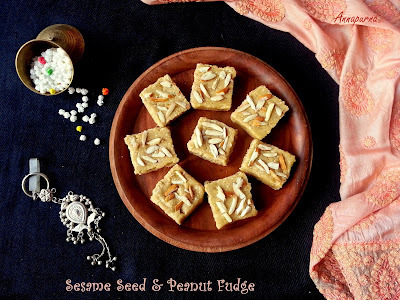 My gujrati neighbour always shared this with me whenever she made this winter treat.Somehow till now I haven't tried making it, but your recipe looks so tempting that I should try it soon. Such a yummy Unddhiya. I wish I can get some of it. I too do not need any chapatis or rice with it. Such a delightful and healthy recipe. 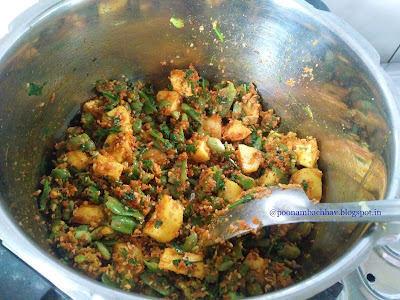 Vegetables, methi muthia, spices wow so many taste and flavour in one dish. Never tasted it before but now I am drooling. I have to try it soon. Superb share. Your prep is making me drool Poonam. Undhiyu is our family favorite but even in Gujarat you'll find that the recipe varies from region to region. We occasionally make it with masala as you've done. We also make it using green masala like fresh chillis, fresh garlic, ginger etc a bit of salt and that's all. The whole mixture is steamed in pot over low heat. Very nicely explained, Poonam. It sounds easy to make and the pressure cooking makes it fool proof and of course retains nutrients of the fresh seasonal veggies. 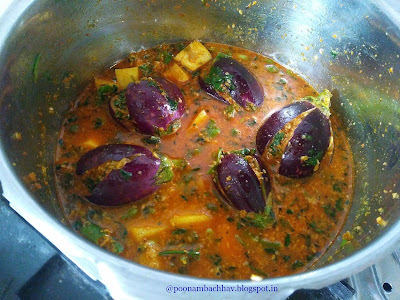 Undhiyu looks so delicious and tempting.I am yet to try this wonderful dish .Fantastic share Poonam.